MESSAGE TO INDIVIDUALS OF THE WORLD FOR SUPPORT! 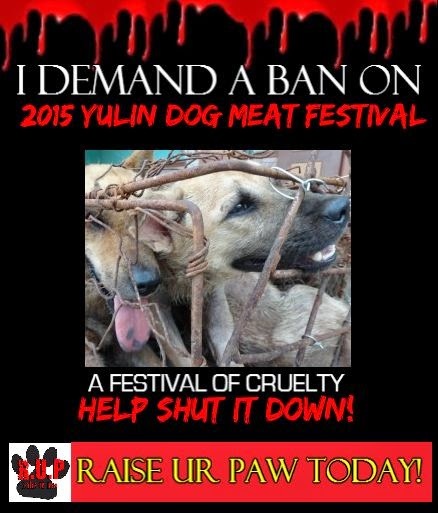 We at Raise UR Paw, a not-for-profit incorporation, are writing this letter to request your immediate and urgent support and participation in aiding the ban of the Yulin Dog Meat Festival which is due to take place on June 21, 2015. This festival of inhumanity is raising outcries of negativity and outrage from individuals worldwide, due to the barbaric and torturous nature & actions which have/will inflict much pain, torture, suffering and death upon thousands of dogs – thus making it very imperative that this event/trade be stopped and that aid and support is desperately needed in order to successfully achieve this goal. Last year, 2014, individuals worldwide came together to not only raise their voices but also to unite as one to bring upon awareness, and took to the frontlines in order to save “man’s best friend” from a fate that was worse than death – Unfortunately, although some dogs were saved, there were countless others who were not so lucky (strays, stolen pets, dogs raised on dog farms) It was certainly a heartbreaking and shameful scene – a scene that might have been prevented if there was more participation and involvement from media and voices of those of power and influence. In our time, and the time of the past, we have come to observe dogs as more than just man’s best friend, but beacons of loyalty, companionship, unconditional love and respect – even putting their own health and lives on the line to save and protect our race – and yet many people remain within the shadows of silence, while these babies are paying the price for their loyalty to us with their suffering and innocent blood being shed – a shame that falls upon not only those who participate in this inhumanity, but also upon those who turn away and ignore – not able to spare one single minute to reach out to help these innocent lives. Something needs to be done today – not only to stop/ban this event/trade, but to also introduce and establish animal welfare and protections laws which will be enforced in order to help these innocent beings – and for this to be achieved we must all unite as one – for the responsibility to save/protect these animals falls upon us all. We truly hope that each individual takes a single moment to see through the eyes of these beings, to imagine the pain/suffering/death in which these animals are forced to endure and do what is right by standing up and raising their paws along with us to save these souls, and end this horror and disgrace once and for all.